This overpipe features a smooth interior and a corrugated exterior that alternates between white and clear. These products are made to slip over rigid 2", 3", 4", or 6" Sch 40/80 pipe. They also feature different burst pressures and working pressures to suit your needs. Please note: There are no returns on cut PVC pipe covering, so please be sure you are ordering the correct size and length. The price you see is the price per foot on the custom length helix hose overpipe. Thank you. THIS FLEXIBLE CORRUGATED PIPE IS MADE IN THE USA. 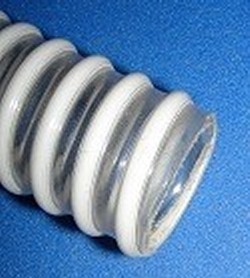 BTF, By The Foot, flexible pvc duct/hose, clear, smooth on the inside that is made to slip over 3" Sch 40/80 rigid pipe, or other pipe with an OD of 3.50". Pipe is clear for easy inspection with white helix for strength. ID of this pipe is 3.50, OD is approx. 4.15" Min. Bend radius: 7", Working pressure at 68F: 35PSI, Burst pressure: 95PSI, Vacuum Rating: 28"/Hg. Use Stainless Steel Hose Clamps SS64 (lower pressures) or Spiral Clamps (higher pressures) to secure.